Created by robot expert Robert Malone, chairman of the Automation Hall of Fame, the plans are ingenious and include a materials list (rounding it up is like a treasure hunt!) plus step-by-step directions illustrated with detailed, full-color photographs. 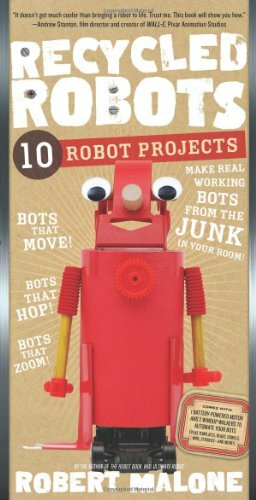 The kit includes all the essential accessories: a battery-operated motor and two windup walkers, plus templates, dowels, beads, wire, mounting squares—and googly eyes. Transform a leftover action figure into Armorbot. Start with a few paper cups, and presto, Cupbot. Repurpose cardboard boxes and tubes into the endlessly adaptable Boxbot—it even has a rotating head. From the tiny Hopbot—put it on the floor and you’ll see how it got its name—to giant Styrobot, here are ten plans to make a roomful of robotic wonders.